Thesecond ofaseries of articles celebrating the Waterford Foundation’s 75thanniversary. By April 1864, after three hard years of war, the women of Waterford were at wit’s end. Most of the men were in self-imposed exile across the Potomac, or fighting, or in prison. The Union had clamped a tight blockade along the river, and once-rich Loudoun, repeatedly plundered by troops from both sides, was destitute. The blockade applied to all, even the loyal majority in Waterford and north Loudoun who had strongly opposed secession. Loudoun was a lawless no-man’s land. The women of Waterford wanted most of all for federal troops to occupy the county, restore order, and permit loyalists to trade with the North. But how could they convey their plight? To prove her point, Lida and her friends had a back-up plan to advertise their town’s difficult situation. In May she, her older sister Lizzie Dutton (24), and neighbor Sarah Steer (26) launched The Waterford News, a defiantly pro-Union newspaper inside Confederate Virginia. They declared their objectives were “to cheer the weary soldier, and render material aid to the sick and wounded.” Risking arrest or worse, they leavened their eyewitness accounts of hardship and horror with youthful wit and unabashed patriotism. The little paper’s fame quickly spread beyond Loudoun County. It was praised by Horace Greeley’s New York Tribune, and a Maryland resident passed along the first editions to President Lincoln. The accompanying letter to the president reported that the “fair Editresses” had by late June 1864 already raised nearly $1,000 (an impressive $17,000 in today’s value) for the U.S. Sanitary Commission, a non-government organization providing medical care to Union troops. Two copies of the Waterford News were found among the Lincoln papers at the Library of Congress. History fails to tell us if the president actually read the newspapers, but we’d like to think he did. Under their slogan “THE UNION FOREVER,” the articles in the paper were staunchly Unionist, a position reflecting Waterford’s rejection of the 1861 secession by a vote of 221 to 30. “The News” column was often devoted to the incursions and sufferings caused by “Grey Ghost” John Mosby and his partisan Confederate rangers. The young Quaker women designed their newspaper to appeal to allUnion soldiers, not just the wounded and sick. A tongue-in-cheek section entitled “Marriages,” was blank every issue. The November 1864 edition posed this riddle: “Why are Rebel ranks like our Marriage Column?” Answer: “Because there is little probability of their ever being filled.” The Waterford News editors often complained it was simply impossible to find eligible men of their generation under any circumstances. It was Lizzie Dutton who delivered the first draft issue of The Waterford News for printing and distribution. With draft in hand at the Virginia shore opposite Point of Rocks, MD, she failed to find a small boat to ferry her across. Unable to get the Union soldiers to cross the Potomac from the Maryland side, she began wading into the river, carrying her precious burden. This bold action did get their attention, and the soldiers finally agreed to deliver the draft to her father, in exile at Point of Rocks, along with instructions for its publication. 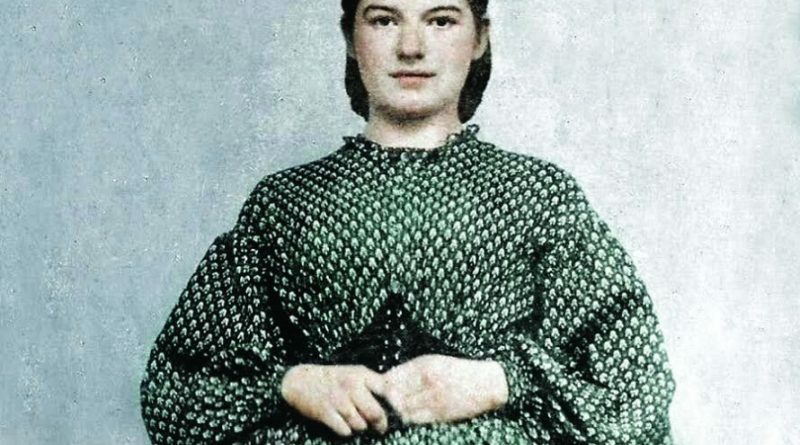 It was fortunate Lizzie was no longer carrying the newspaper, because Mosby’s men had been watching her from a vantage point high on Catoctin Mountain. They stopped Lizzie on her way home, found nothing suspicious and apparently believed whatever story she told to explain her actions. In future, delivery of the drafts was entrusted to Sarah’s handicapped cousin, Billy Steer, who was less likely to arouse suspicion. in one booklet available for sale for $8 at the holiday event detailed below, or online for $10 (postage and packaging included) on the Waterford Foundation’s website: waterfordfoundation.org/product-category/books. All are invited to celebrate the holidays with an old-fashioned singalong and Christmas concert featuring Madeline MacNeil on the hammered dulcimer and Jeff Bean on the pump organ at theJohn Wesley Community Church, 40125 Bond Street, in Waterford, from 4-5 p.m. Sunday, Dec 9. Children accompanied by their parents are welcome and the admission “price” is a plate of cookies (or another finger food) to share. (This article draws heavily on two publications: The Introduction by Taylor M. Chamberlin, Bronwen C. Souders, and John M. Souders to the annotated collection—”The Waterford News: An underground Union newspaper published by three Quaker maidens in Confederate Virginia 1864-1865″—published by the Waterford Foundation in 1999, and Chapter 17 of “A Village in Time 1660-1990. Discovering American History in a Small Virginia Quaker Village” by Waterford resident Neil C. Hughes, published by Branden Books in 2017).